Can you determine whether an image is cellular or celestial? Each day this week (Monday, December 26-Friday, December 30), a poll with new images will appear; come back each day to learn the answers to the previous day's images and to see how everyone voted. Each new poll will start around midnight EST; you may want to bookmark this page so you can easily return. Reuse of images may be subject to licensing restrictions. Our Cellular/Celestial quiz has ended; if you are new to this and want to try your hand, click here immediately to see the daily images rather than the answers. Thanks to all who played along and to David Orloff of The Cell: An Image Library for coming up with the idea and the needed cellular images! 1% selected option 5 -- You call that art? 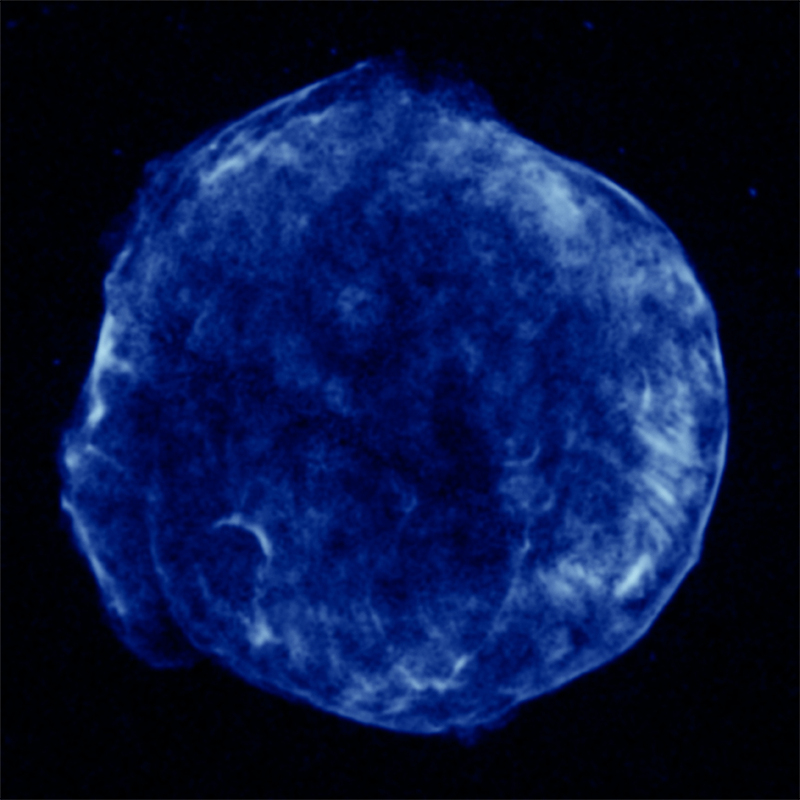 The Monday image 1 is cellular; it's a mouse oocyte. Check out the comment on the image source page! The Monday image 2 is celestial and is an image of our neighborhood star. More information is available at the source link. How did you do? 0 points, 1 point, 2? Please let us know! Comments are most welcome; please reply below. Don't forget to come back to try each day's quiz! 2% selected option 5 -- I don't know art, but I know what I like! Credit: Credit: NASA/CXC/Rutgers/K.Eriksen et al. How did you do? Give yourself one point for each image you categorized correctly. Comments are most welcome; please reply below. Remember to come back to try the Wednesday quiz! The Wednesday image 1 is cellular, and shows a cell from a vervet monkey; the source page provides more information and a handy link, too, to information about vervets. The Wednesday image 2 is cellular; this very colorful image is of a human epithelial cell. Did you find that easy or hard? If you have anything to share about this quiz, please reply to this thread. Thanks! The Thursday1 image is cellular; the green in this image is corn stunt spiroplasma, and was sampled from the midgut and trachea of a leafhopper, which is its vector. More information about this image is available at the source webpage. 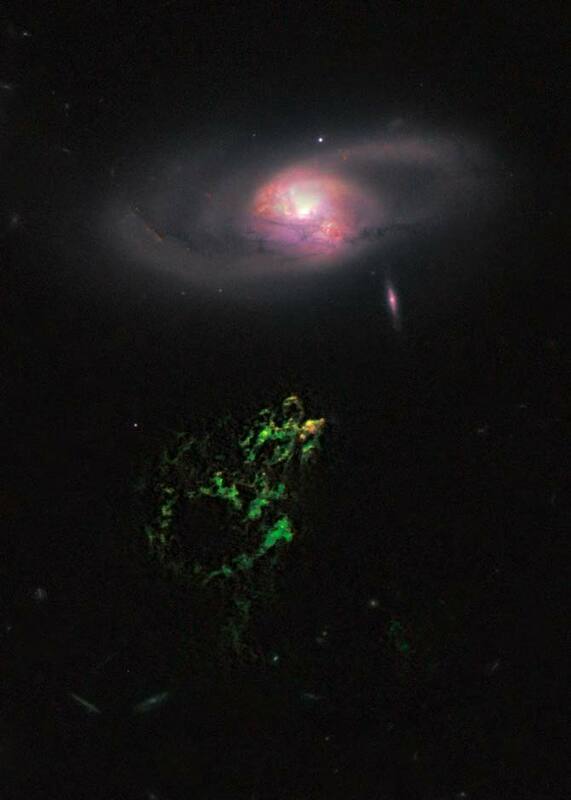 The Thursday2 image is celestial; this is part of the mostly-well-known-among-astronomy-buffs Hanny's Voorwerp, an odd blob of gas discovered by Dutch high-school teacher Hanny van Arkel, a participant in the citizen science Galaxy Zoo project. The translation of "Voorwerp" and more information about this object can be found by following the source link below. Did you know one or the other? Both? Neither? Would answering have been easier had the images not been cropped? (I'm thinking... yes. Yes, it would have been easier!) You are encouraged to post your thoughts to this thread. The answers for the Friday installment of this quiz will be posted here on Saturday. The Friday image 1 is celestial and was taken in infrared by NASA's Spitzer Space Telescope. 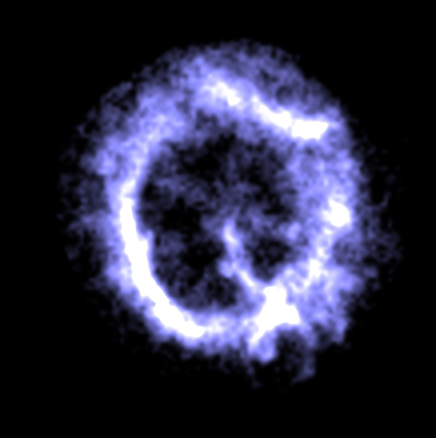 It shows a galaxy containing a quasar, and at the time this image was taken in 2005, brought to 21 the number of quasars found by Spitzer. The page at the source link contains much more information about this false-color image and the objects in it. The Friday2 image is cellular; this interesting image is of a B lymphocyte undergoing division. A chicken B lymphocyte, which brings the number of species shown in this series to... well, never mind! Great colors, and you can read what they mean by clicking on the source link; you can also explore the rest of this 3D image by using the red scroll bar on the source page. How many points did you get? (Give yourself one for each correct identification.) Please let us know your thoughts on this quiz -- including whether we should plan another -- on this thread. Thank you! And thank you for playing, and happy new year! This is cool, and I think I have at least half the answer correct. It does look like this was from a week ago, where is the answer? I don't know what you mean by "cellular or celestial." I think they mean: One is taken with a telescope (Hubble etc. ), one with a microscope (no names, sorry!). It just goes to show what an amazing world we live in! Mike42 wrote: This is cool, and I think I have at least half the answer correct. It does look like this was from a week ago, where is the answer? This quiz runs Monday, December 26 through Friday, December 30. I created the thread on December 19 as a placeholder. This means you're just in time to participate! The answer for the December 26 entry -- today's entry -- will be posted around midnight EST. #1 is Celestial- the sun? #2 is the sun. #1 is a human egg? The quiz is a really interesting brain teaser, and I'm glad to have stumbled upon it. An important piece of feedback, though, is that our responses should be labeled as "guesses" or "answers" rather than as "votes." A vote is the sort of thing that establishes the winning answer based on popularity of that answer. However, in your quiz, the correct answer is already established before the photographs are posted; even if we were all to guess unanimously for a particular answer, our doing so wouldn't make that answer be right. While this may seem to be an incredibly pedantic point, I think it's an important one in terms of distinguishing between scientific empiricism on the one hand and the choice- or opinion-based components of many of our social interactions on the other. Thanks so much--both for the interesting quiz and for your attention to the semantics of how you present it! Thank you, and you might be my favorite new person! I agree with you! Alas, I don't have any control over the wording on the "submit" button for polls, so it is what it is. If I could change the text on the submit button, I would. Also on the spoiler button, because, though I've hidden a couple of responses by wrapping the "spoiler" tags around them, they should not be taken as correct. Image 1 is taken with a microscope. It is a chloroplast (a plastid that contains chlorophyll). Image 2 is taken with a telescope. 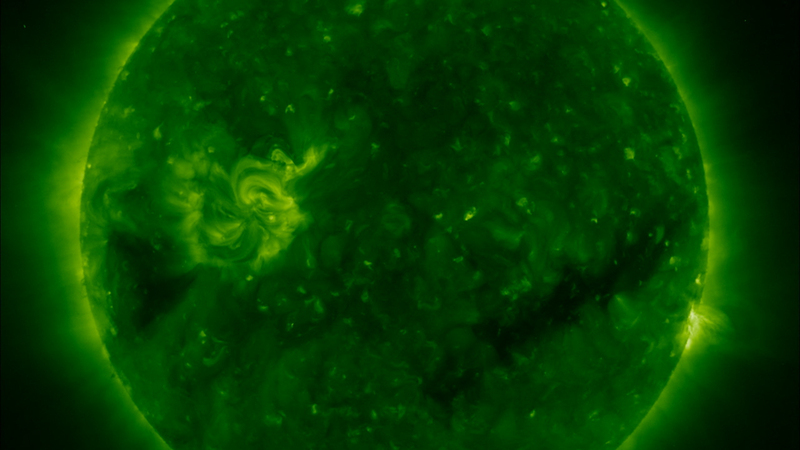 I think, it is a solar granulation. Would be nice to have a facebook upload link to share with friends. abbychia wrote: Would be nice to have a facebook upload link to share with friends. Astronomy Picture of the Day (APOD) is on Facebook. You can share the link from there. Or, copy the link to this thread (below) and post it to your FB page. owlice wrote: Thank you, and you might be my favorite new person! I agree with you! Alas, I don't have any control over the wording on the "submit" button for polls, so it is what it is. Wow. Here I was, thinking that it had been such a banal day--errands and housework and the like--and now I find that in absentia I may have become someone's favorite new person. Well that's a feather to put in the cap of the day. If only my pedantry normally went across so well! Q: What is the difference between a celestial cell? A: One of the two is both the same. I think TNT is onto something here! It's not possible to vote again ?